Travel to the coastal areas of Savannah. You will drive the historic and picturesque Isle of Hope Historic District followed by a docent led walking tour of the Wormsloe Plantation Tabby Ruins. The last stop is at the world famous Savannah Byrd Company for shopping and tasting's. 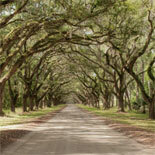 Continue with a drive through the Historic and picturesque Isle of Hope Historic District. Landscaped with old oak trees covered in Spanish moss, the houses range in style from Greek Revival to Craftsman Bungalows. Operates Friday's only. Departs Savannah at 12:00 pm return to Savannah at 5:00 pm. Complimentary Historic Savannah hotel pick-up available with advance notice. Reservations are required. Ticket will have details about re-confirming the tour for date selected. Child ages 3-12 yrs. Under 3 are free.